A few months ago, you could have found Barbara leaping from tree to tree in the depths of a distant jungle. Now she works for an organ grinder on the shores of the English seaside, dancing for spare change and having a thoroughly miserable time. Anxious, trapped and bored to tears, Barbara finds friendship with the organ grinder’s wife – but can either of them escape from the lives they never wanted? A tale of a little monkey in a bad and baffling world. Monkey was written in 2015 to be paired up with a new production of Timothy, and had to feature the same cast and similarly low set requirements. Working to that fairly flexible brief, I outlined to the director an idea I'd had in my head for a few months. I wanted to explore the relationship between an organ grinder, an organ grinder's wife and an organ grinder's monkey, and the ways in which those three characters depended upon each other - and keep each other trapped. 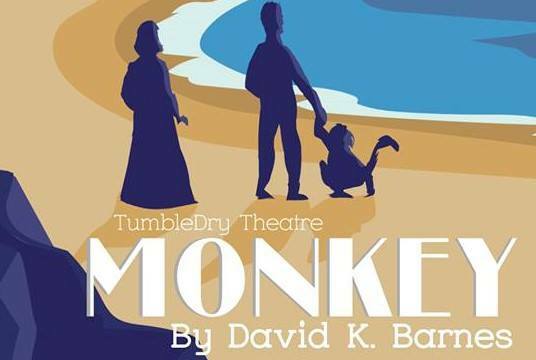 As I developed the idea, I thought that having the monkey, Barbara, portrayed by two actors - one on stage and another providing Barbara's interior monologue - opened new avenues for how I could develop the story, now situated in the kind of seaside surroundings I'd grown up in. Drawing inspiration from the little-seen cult classic series The Strange World of Gurney Slade (by way of, oddly enough, Garfield), it's a sinister and humorous play which I'm glad will be receiving a new production with a rewritten script in 2019. The original cast of Monkey were: Beth Eyre (Barbara's voice), Alys Henry (Barbara on stage), Peter Wicks (Marcus), Sarah Sorensen (Paula). It was performed at the Drayton Arms Theatre, 3rd-4th May 2015, directed by John Rushton.